Corrosion Resistance | Thermal Technology Services Inc.
On certain materials the TTS process optimizes the grain structure to minimize or completely stop rust. 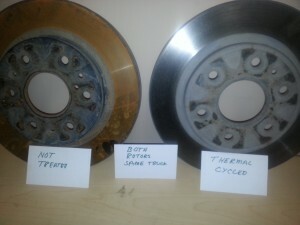 The photo shows 2 brake rotors, both placed on the same vehicle at the same time. This vehicle is used in a highly abrasive atmosphere. Both rotors were removed after 60 days. One had severe penetrated corrosion the TTS rotor had none. This photo has not been retouched. This is the actual condition the brakes were returned to us.